Meier Skis employee Chris Dean marks ski sidewalls as he prepares to shape them at the company's workshop in Glenwood Springs, Colo.
Timm Smith has been in the outdoor gear industry for a decade—just long enough to see one scrappy, independent company after another surrender to the kind of corporatization they once scorned. SmartWool apparel may still be based in Steamboat Springs, Colorado, but in 2005 it was bought by Timberland, which was bought by VF Corporation, which also owns The North Face and has an investor line-up that reads like a who's who of Wall Street. Yoga-and-climbing brand PrAna was recently acquired by Columbia Sportswear, along with Mountain Hardwear, Sorel and Montrail. Utah-based Black Diamond, once peddled from the back of a car, just turned a $40-million profit by selling Gregory packs to luggage giant Samsonite. And so on. "It seemed to me that many companies outgrew what they stood for," says Smith, 34. "[The industry] had become very much about turning the crank and running products on the Asian superhighway." So in 2012, a disillusioned Smith quit his job at Gore-Tex and moved from urban Maryland to Pagosa Springs, Colorado, a town of 1,700 on the southern flanks of the San Juan Mountains. He took a marketing job with an idealistic startup called Voormi, which pledges to manufacture its outerwear in the U.S. and buy only Rocky Mountain wool. And though it has just seven employees so far, co-founder Dan English hopes that by headquartering in a small town, Voormi can help stem the tide of talent flowing from the rural to the urban West. "We wanted to be super authentic," English says, of his move from Boulder to Pagosa. "There's no major interstates here, no major airports. Part of being an authentic brand is living the lifestyle that we preach." Voormi and other niche gear companies—like Duckworth, a Bozeman-based clothing brand that buys only Montana wool, or Meier Skis, a Colorado ski manufacturer that uses locally harvested aspen and beetle-kill pine—hope to leverage that "authenticity" to compete with far bigger rivals. They're banking on the rise of microbreweries and farmers' markets as evidence that some Americans are willing to pay more for quality local goods, and they're already having an impact on small towns, sheep ranchers—even machine salesmen. "If you look at consumer trends, you're seeing a return to people caring about the stories behind things and where the things they buy come from," Smith says. "What happened with craft beer is an interesting model." There's just one caveat: Outdoor gear ain't beer, and the very isolation and rugged terrain that allow Voormi's testers to head straight out the door and into the mountains has caused other companies to go under entirely—or outgrow and abandon their rural birthplaces. "Made in (small-town) Colorado" is a great marketing strategy for breaking into the $120 billion-a-year outdoor industry. But can it sustain a business for the long haul? On a cloudy June morning in Glenwood Springs, Colorado, Matt Cudmore's 7-year-old twin boys are playing videogames while waiting for summer camp to start. A room away, 23-year-old Chris Dean shapes ski patterns from aspen boards and blasts Damien Marley tunes. 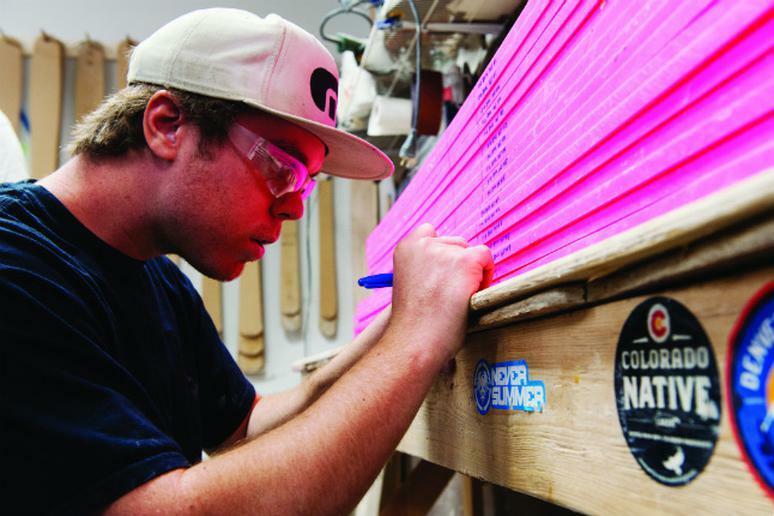 Dean is one of four employees at Meier Skis, the company Cudmore started in his garage five years ago with $1,000 inherited from his grandmother. His first pair of alpine skis took six months to create; now, with the help of some new tools and an investor, he's making 500 pairs a year in a small factory outside town. He says he'll relax when he hits 2,000. "The guys at Lowe's are like, 'Matt, dude, I want to live the dream like you're doing.' " He laughs. "What, you want to work till 10 o'clock every night and get allergies from epoxy?" What he's saying is: Making skis isn't as romantic as it sounds. Cudmore hits the slopes less often now than before starting Meier Skis, and though sales have doubled annually, he lives in fear that the business into which he's poured everything could go belly-up. "Don't get me wrong," he says. "I love what I do. But it's not like slapping sandwiches together. That's why we're pushing our story." Cudmore hopes his story will distinguish Meier from the dozens of other outdoor companies that have come and gone from Western towns like Glenwood. The allure of living where you play has long drawn outdoor businesses to the rural West, and an anti-establishment, entrepreneurial spirit—combined with a lack of jobs—may be why so many gear companies begin here. There are other benefits, too: Sometimes small towns come equipped with an eager, low-cost workforce, like the skilled Navajo workers who once sewed Osprey Packs in Cortez, Colorado, or the tight-knit group that made sandals "with love" at the Chaco factory a few hours north in Paonia (HCN's hometown). One of those employees was Dave Shishim, who in 2001 moved from Kansas to western Colorado to take a job at a small airport. One day, Chaco founder Mark Paigen was waiting for a flight and the two got to talking. Shishim was hooked. Before long, he'd invested in the sandal company and upended his life (again) to become its customer service manager in Paonia. "I was enamored," he says. "We had an extremely dedicated local workforce, you could ride your bike to work, the product was made in the U.S. … It was utopian." But as his business grew, Paigen—a river guide who began making sandals in his garage—found utopia lacking. "I loved living there, but it was not an easy place to run a business," he says. "There were huge challenges in recruitment and logistics." For one thing, manufacturing in Paonia meant adding an extra $10 to $15 per pair to sandals that were already more expensive than their foreign-made competition. And there were other problems. So in 2008, Chaco joined the 99 percent of American-brand shoes now made overseas and began outsourcing to China. A year later, Paigen sold the company to Wolverine Worldwide, which also owns Merrell and Keds, and its Paonia headquarters were shuttered permanently. A hundred workers lost their jobs. Many more in the town of 1,600 felt betrayed. Shishim is now back to working at the airport, and Paonia gets by on agriculture and a shrinking coal-mining economy. Yet making it work in a small town isn't impossible. Some Colorado companies, like Scott Fly Rods in Montrose, have succeeded by making a product so specialized it can't (yet) be outsourced. Others, like Melanzana—which has been making super-soft fleece sweatshirts in Leadville for 20 years—simply reject the "grow-at-all-costs" philosophy. As if to flaunt its stubborn independence, Melanzana is named for the Italian word for eggplant, because according to the company's website, the vegetable represents "the exact opposite of every ultra-cool outdoor clothing company named for an exotic mountain locale, imposing rock face, or ancient Tibetan rite." Founder Fritz Howard isn't making a killing by sourcing, sewing and distributing under one roof in a high-altitude old mining town, but that's OK with him—and with Melanzana's loyal following, who see it as one of the few brands that haven't sold out. "We're authentic without having to say we are," Howard says. "I just wanted to live in a mountain town and do my own thing, really." Five hours southwest in the town of Cortez, Osprey Packs has managed to compete globally while remaining locally rooted. Mike Pfotenhauer moved the company from California to Colorado in the early '90s, but by 2003 it had outgrown those digs, and Pfotenhauer began outsourcing manufacturing to Vietnam. The company's design hub is now in Marin County, California—which offers a larger creative pool—and it'll soon move distribution to Salt Lake City to be on the national railroad network and reduce Osprey's carbon footprint. But Pfotenhauer remains committed to Cortez. The company employs about 75 people in the town of 8,500, and he and his wife just moved back there. And though he's had plenty of offers to sell, Pfotenhauer has turned each one down. "I think we remain strong by remaining independent of the typical corporate system," he says. "You have to be wary of opportunities from the outside." Paigen, however, has a different take. Today he lives outside Boston, where he has launched a proudly Made-in-America menswear line called Osmium. But he cautions that while the gear industry—and market—may be ripe for a made-locally movement, finding the sweet spot between idealism and success is easier said than done. "When growth is knocking at your door," he reflects, "it's not as simple as just saying no." This story originally appeared on High Country News. The author is solely responsible for the content.